Steina and Woody Vasulka began to use the medium of video as early as 1969, first documenting jazz performances, rock concerts and the underground activities of ‘illegitimate culture’. Exploiting the relationship between the electronic signals for both sound and image, they started a didactic exploration of the limitless possibilities of video processing using a range of newly crafted technological tools. Each tape produced was a by-product of the dialogue between the Vasulkas and their machines, as they systematically analysed and deconstructed the fundamental materiality of video through spatial, temporal and sound/image manipulation. The Vasulkas are the creative pathfinders of the electro-magnetic spectrum, whose works – infused with the fizz and crunch of the analogue age – are as mesmerising and astounding today as in their original moment of discovery. Steina and Woody Vasulka will present three unique events during the weekend, which includes a continuous one-day gallery projection of key works. Since 1969, when they had their first access to primitive video equipment, the Vasulkas have conducted a dynamic exploration of the electro-magnetic image. 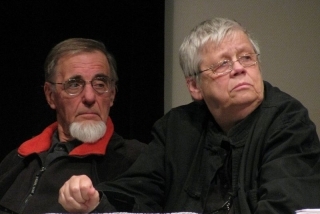 Woody was born in Czechoslovakia in 1937 and trained as an engineer and filmmaker, Steina was born in Iceland in 1940 and became a professional musician. They married in 1964 and immigrated to America the following year. After seeing the ground-breaking TV as a Creative Medium exhibition at the Howard Wise Gallery in 1969, they devoted their activity to video, first documenting New York cultural events including jazz and rock concerts and underground performances using a Sony Portapak camera. Soon after, they began to experiment with using VCS3 and Buchla audio synthesisers to alter the electronic video signal, making their first image-processed tapes. 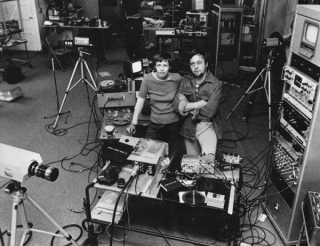 In 1971, together with Andy Mannick, the Vasulkas co-founded The Electronic Kitchen, an electronic laboratory for experimentation with sounds and images. The Kitchen soon became one of the artistic centres of New York, presenting screenings, performances and concerts ranging from the new music of La Monte Young to the new wave of Talking Heads, and it continues today as one of the city’s most prestigious multi-media art spaces. Throughout the 1970s, the Vasulkas continued their tireless investigations into the phenomenology of video, with each tape produced being effectively a by-product of the dialogue between them and their machines. Steina and Woody did not create their images from video synthesisers; their unique approach involved the processing of previously recorded material through a series of modular units, frequently using the input of a separate electronic signal to control the effects. Working in collaboration with creative engineers including George Brown, Bill Etra and Eric Siegel, they developed a new range of tools and devices with which they can further investigate the image. Their arsenal of analogue equipment contains the Rutt/Etra Scan Processor, Dual Colorizer, Multikeyer, Programmer, Horizontal Drift Variable Clock and the Field Flip/Flop Switcher. Much of their work explores and exploits the similarity of the sound and image signals, producing a mesmerising range of synaesthetic video before the onset of the digital age. 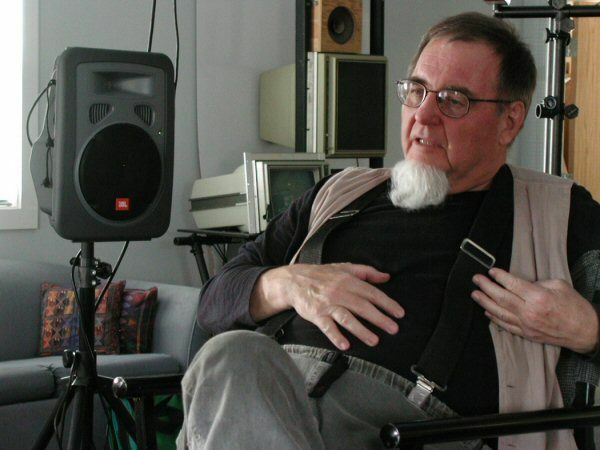 In 1973, the Vasulkas moved to Buffalo to teach at the Media/Study Center, where they become part of a faculty including filmmakers and theorists Tony Conrad, Hollis Frampton and Paul Sharits. The pair also began to work individually during this time. Steina embarked on the Machine Vision series, developing mechanical systems to control the camera, distancing it from the human viewpoint. Woody began to explore the digital realm, custom-designing the Digital Image Articulator. Both subsequently worked on interactive projects and large-scale installations, adding a sculptural or monumental element to their practice. As pioneers of video art, Steina and Woody Vasulka stand alongside Nam June Paik, Peter Campus and Joan Jonas, with the Kitchen and their own studio as much a point of focus as the early activist groups Video Free America, Raindance and Guerilla Television and the innovative American television laboratories of NCET, WNET and WGBH. This weekend of events is the first opportunity in decades to see a substantial collection of the Vasulka’s early works in the UK, and a rare chance to hear the exuberant and vivacious duo discuss their work from a practical, rather than theoretical, point of view. An overview of Steina & Woody Vasulka’s video processing tools. The VCS3, named for “voltage-controlled studio,” is best known by the name Putney in the United States. This analogue, duophonic synthesiser is equipped with a relatively small connection panel, compared to others of that time. It can control audio signals and their relationships to one another from the device itself. Integrated oscillators produce the repeated fluctuations of voltage that modulate the sounds. Conceived by atonal musical composers, the first version of the device did not have a keyboard. This sequencer allows the programmer to separate two video sources in a determined sequence. It controls, among other things, the alternation of the points of view of two cameras in real time on the same monitor. The sequence is controlled according to various parameters: the rhythm of the regular sweeping of the screen, sound pulsation, etc. The Horizontal Drift Variable Clock is not in itself an instrument, but rather an external source of synchronisation that can control the horizontal displacement of a video image. By adding an oscillator with the capacity to go up to 15,000 cycles to the portable camera adapter (Sony Portapak), it is possible to control the voltage of the horizontal synchronisation signal. Typically, two cameras make up the system: one camera is hooked up to the normal vertical and horizontal synchronisation signal, while the other camera, whose image is being superimposed or keyed on the first, receives a different horizontal frequency. This will then result in the horizontal movement of the image towards the right or the left. The Vasulkas also used this technique to cause images to travel from one monitor to another in multi-monitor compositions. This processor modulates the deflection line of the electromagnetic field of television images. On a normal screen, the synchronisation signals are controlled by electromagnets that guide the movement of an electromagnetic ray so as to scan the 525 screen lines. The Rutt-Etra monitor contains a system of electromagnets and a built-in synchronisation mechanism for processing the video signal. The modulations alter the field of raster lines, which are vertically deflected and appear to adopt the contours of objects. This digital sequencer is controlling an analogue video keyer in real time. By way of the keying process, a chromatic value is removed from an image on which a motif will be added. In conjunction with the keyer, the Multikeyer enables six video sources to be merged and placed on different planes according to a pre-programmed sequence. The only digital instrument in the Vasulka’s instrument collection before 1977, the Programmer can control the actions of a switcher or a keyer, both analog devices. It can store operation sequences in its memory and activate them at any chosen moment. This digitizer breaks the video image down pixel by pixel and reshapes the components in an environment governed by mathematical laws. The Digital Image Articulator generates effects of pixelation, manipulates the borders of an image, stretches the image vertically and horizontally, and duplicates it several times on the screen. It is also used to create sequences of complex geometric motifs based on algorithmic structures. Performers : Paul Ambrose, Ian Anderson, Billy Andrews, Gary Bartz, Tally Brown, Larry Chaplan, Don Cherry, Kevin Coe, Jackie Curtis, Candy Darling, Miles Davis, Jack De Johnette, Eric Emersion, Estelle !, Christmas Eve, Michael Enderson, Jimi Hendrix, Stephen Holt, Keith Jarret, Jay Johnson, Aunt Josie, Agosto Machado, Taylor Mead, Buddy Miles, Geri Miller, Mario Montez, Airto Moreira, Paul Morrissey, Ondine, Rita Redd, Al Sayegh, Silva, Ekathrina Sobechanskaya, Steve Stanwick, Steina, Artchie Strips, David Susskind, Tinkerbelle, Jethro Tull, Richard Weinstock, Holly Woodlawn. In Participation the Vasulkas present vignettes of marginal culture – rock concerts, gay theatre, and impromptu street theatre. 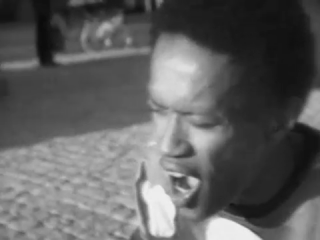 These tapes embody the originality and spontaneity that characterise early experiments with video: Don Cherry eloquently playing his trumpet in Washington Square Park, Jimi Hendrix and Jethro Tull performing at the Fillmore East, Andy Warhol’s gang arguing vehemently on the David Susskind Show about whether or not they are being exploited, and transvestites acting impromptu skits in makeshift theatres. Participation evokes not only the utopian moment of the counterculture at a time of political upheaval but also the utopian moment of the video medium, when a sense of immediacy seemed to imbue every shot – a time when video practitioners like the Vasulkas were excitedly discovering the possibilities of electronic imaging. Continuous projection at Candid Arts Trust. Screening at approximately 11am and 2pm. The Vasulkas capture the counter-cultural spirit of the era in a series of performances by Larry, Jackie Curtis, Steina, Charles Hayworth, Helen Wong, Alfons Schilling, Thierry Benizeau and Daniel Nagrin. These ‘sketches’ also reveal the Vasulkas’ early experiments with electronic image manipulation. Performer: Charles Hayworth. Audio: Gino Piserchio. A circular image of a reel is set in a rapid motion by a difference in horizontal camera drives. The image repetition results from a time delay produced by re-entering the signal into the system: a visual echo. Sounds result from a video signal interfaced with a sound synthesiser. A re-scan camera is pointed at the television monitor displaying a pre-recorded tape. A misalignment of the horizontal hold causes a vertical multiplication of the image. Various camera images are randomly inserted onto a pre-recorded tape. These forced edits become the source of abrupt voltage changes in the audio when looped through a sound synthesizer. A face, pre-recorded on a videotape, is manually forwarded on the playback to produce image decay. 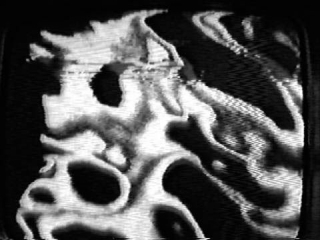 An audio generated shape is pre-recorded on a videotape which is then manually moved on the video playback to produce image decay. The protagonist is a video feedback, processed and controlled through a video keyer. Sound is from video signals interfaced with an audio synthesiser. 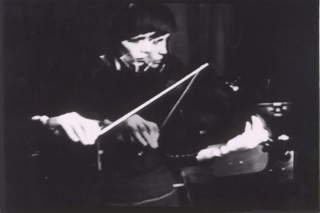 Steina presents a live adaptation of her seminal tape Violin Power, using MIDI violin and customised software to process the video image in real time. Plus a screening of Orbital Obsessions, a multi-layered studio performance/exploration of reshaped video space. The ZETA Violin is a five-stringed electric violin with a MIDI output. The assignment, at the moment, is that stops on A and E string point to frame locations on the disk. The D and G strings control speed and direction and the C string is a master controller assigned to address segments on the disks. In another programming scheme, the C string controls which upper strings get assigned their function, as Steina experiments to make the performance more musically interesting. The first excerpt investigates the impact of varying pitches on the speed of the image. Steina’s body is invaded by a sort of double-exposure that quivers like the vibrato produced by a violin bow. In another sequence, Steina adds further components to an already complex interface. The sound modulations of the violin cause the viewpoints of two parallel cameras to alternate. Steina is first seen from behind, and then the bow’s movement seems to deflect the signal and a keyed-in image of Steina from the front appears. This effect is generated by the combined use of a keyer and an audio synthesiser (Harald Bode’s Phase Shifter) in closed circuit with the two cameras. Other excerpts feature effects generated by the Scan Processor developed by Steve Rutt and Bill Etra. The sound waves seem to cause ripples in the image’s surface, while the bow’s friction on the strings results in textured visual effects that evoke the violin’s timbre. Finally, the representation of the performing musician, the sounds produced, and the modulations in the video signal converge into a single luminous entity. The Vasulkas are deeply intrigued by the interface between audiotape and videotape; indeed, this interface is the focus of such pieces as Noisefields (1974) and Voice Windows (1986). Violin Power adds an additional dimension to this dialectic research by simultaneously showing the gestation of images, their mediation by instruments (violins, synthesizers), and the moment when these images crystallise on the monitor. Initially, they identified two properties peculiar to video. Both audio and video signals are composed of electronic waveforms. Since sound can be used to generate video, and vice versa, one of the first pieces of equipment the Vasulkas bought was an audio synthesiser. Many of their tapes illustrate this relationship – one type of signal determines the form of the other. Their second interest entailed construction of the video frame. Because timing pulses control the stability of the video raster to create the “normal” image we are accustomed to, viewers rarely realise – unless their TV set breaks down – that the video signal is actually a frameless continuum. This fact, discovered accidentally, fascinated the Vasulkas. Since the mid-1970s, Woody Vasulka’s work has focused on a rich articulation of the syntactical potential of electronic imaging. After producing a pioneering body of tapes in collaboration with Steina in the early 1970s, he has since undertaken a sophisticated exploration of the narrative and metaphorical meaning of technological images. Vasulka’s development of an expressive image-language has evolved from a rigorous deconstruction of the materiality of the electronic signal, through experiments with new technologies of digital manipulation, to the application of these imaging codes to narrative strategies. The culmination of this investigation, Art of Memory (1987), is one of the major works in video. In this lushly textured, haunting essay, Vasulka applies a highly evolved imaging grammar to a metaphorical discourse of collective memory, history, and the meaning of recorded images – envisioned as a spectacular memory-theatre inscribed upon the landscape of the American Southwest. In his early investigations of the vocabulary of such devices as the Digital Image Articulator, Vasulka emphasised the dialogue between artist and machine, as manifested in real-time creativity and process-oriented experimentation. Through digital manipulation, he continues to explore the malleability and objectification of the electronic image as a means of rendering a complex inventory of rhetorical devices. With the fantastical ‘electronic opera’ The Commission (1983), Vasulka began to apply these codes to the development of narrative and metaphorical strategies, an inquiry that has dominated his later work. Woody Vasulka was born in Brno, Czechoslovakia in 1937. He studied at the School of Industrial Engineering in Brno and the Academy of Performing Arts Faculty of Film and Television in Prague. With Steina, he has won numerous awards and grants; their collaborative works have been exhibited internationally. His individual works have been shown in numerous exhibitions, at festivals and institutions including the International Center of Photography, New York; Los Angeles Contemporary Exhibitions (LACE); Carnegie Museum of Art, Pittsburgh; and the Whitney Museum of American Art Biennial, New York. Woody Vasulka lives in Santa Fe, New Mexico.